Join your local homebrew club! Paul and Max are back at "Not All Hop Is Lost", the local homebrew store, to complain. Max: We bought the ingredients here, and now our homebrew doesn't taste good. Homebrew store employee: I see; if your beer tastes weird, it's the store's fault, and if it's good, that's because you're such a great brewer even on your 2nd batch. Homebrew store employee: I just work here, I don't drink! Homebrew store employee: Sorry, I'm on a diet! Verkäufer: You know, you should probably take it to the Salads. 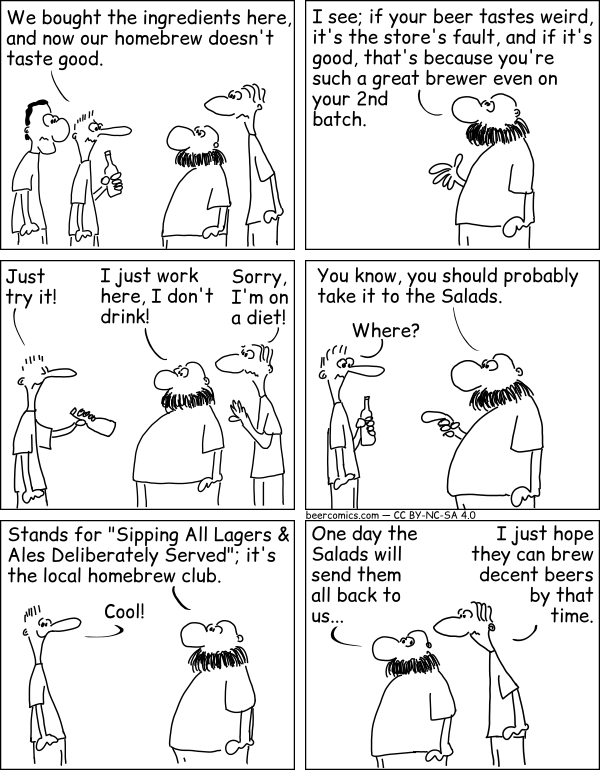 Homebrew store employee: Stands for "Sipping All Lagers & Ales Deliberately Served"; it's the local homebrew club. Homebrew store employee: I just hope they can brew decent beers by that time. See the salads by Robert Wenner is licensed under a Creative Commons Attribution - NonCommercial - ShareAlike 4.0 International License. Permissions beyond the scope of this license may be available upon request at https://beercomics.com/imprint.html.